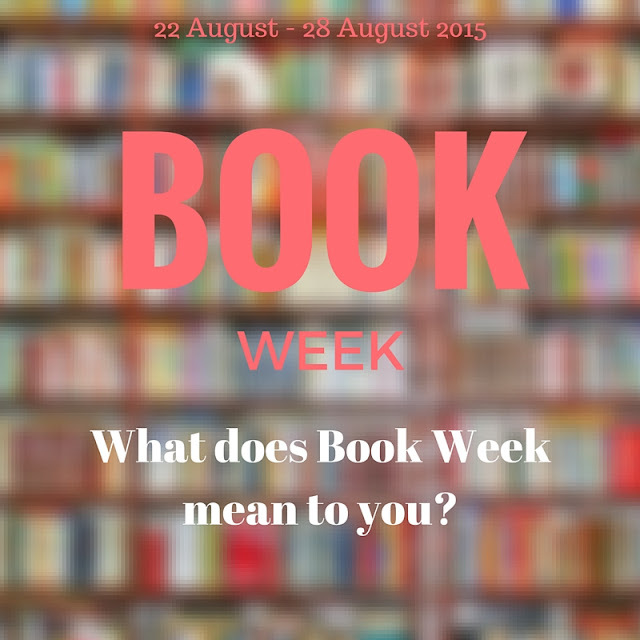 Book Week: Saturday 22 August - Friday 28 August 2015. The Children's Book Council of Australia (CBCA) celebrates its 70th anniversary this year. Their Book Week theme for 2015 is "books light up our world". Books certainly light up my world. They always have. This year books are lighting up my world even brighter than usual. I guess because I've read a whole bunch of new books recently by Australian authors outside my normal genre which I have thoroughly enjoyed. It's given me back my spark. Also because both my kids are suddenly requesting books to read which is a new phenomenon (thank you John Green). They're books we've all been reading which gives us something to talk about. But mainly because my own books are finally starting to take off and with increased online sales and a distribution deal, I can see a light shining at the end of the tunnel. When I was a kid I enjoyed the challenge of Book Week. I remember brainstorming with Mum as I worked out which children's book character to dress as for the Book Week parade at school. I don't recall all my outfits but there were two standouts: Old Mother Hubbard and Olive Oyl. Maybe that's all there was! I'm not sure if it was something we did every year or not. As a parent I haven't loved the challenge quite as much. When it comes to my children the whole "get dressed up for Book Week" thing seems to have been a bit sporadic. You'd think my memory would serve me better given they're a hell of a lot younger than me (hell - they're still kids), but I really can't remember any stand-out costumes. I do recall my daughter going as Alice in Wonderland one year and Kung Fu Panda more recently (although I think the latter was just an excuse to wear a onesie to school). My boy has shown little interest in getting dressed up as anything other than himself. Not even the whole super hero thing can excite him. He's just not into "putting himself out there". As an author, Book Week brings with it a whole new feeling. I don't even know how to describe it other than to say it's a mixture of excitement and pride. To have someone send you a photo of their child dressed as Cheer Chick Charlie is just plain cool. I'll never forget the first time. It was in 2012 within two months of the release of my first book and a parent from Victoria sent me a photo of her twins dressed as Charlie. I couldn't believe it. I swore I'd remember that day forever. Since then I get around five or six photos a year from fans who have chosen Charlie as their Book Week inspiration. I get to feel that same buzz over and over again. It doesn't change. It's just plain cool. Children's Book Week officially kicks off tomorrow. As a Book Week fan I'm looking forward to seeing what great characters are out there and what kids are going to dress as. As a parent nothing much is happening. My kids just don't feel inspired to dress up this year. As an author I'm looking forward to seeing how many Charlie's might be out and about. Seeing those pictures must be such a buzz! I just had my first book week with my daughter and it was great fun, she had lots of fun choosing her character, I told her it had to be a book character not a movie character like most of the kids show up in, she chose Alice in WOnderland. What a thrill to have a little girl choose your character as her favorite!! We love books at our house too and make sure the Tiny American has lots to choose from. So glad my kids love books as much as we do. Our six year old is planning on going as Zac Power (a spy - a kids version of James Bond! ), great books without being too grown up with plenty of fart jokes to appeal to primary school aged boys! Our school stopped the book week parade a few years ago I think because it was placing pressure on some of the families in our school community. But I believe the kids participate in book week related activities. We also participate in the Premiers Reading Challenge every year.